Add Insynctive technology to make your Pella® windows and doors do more for you. Security sensors and motorized between-the-glass shades and blinds take your windows and doors to the next level. Monitor and control your Pella® products from virtually anywhere and sync your windows and doors to your home automation system for the ultimate in-home control. Explore the options below or contact us today to learn how Pella® windows with Insynctive technology can make your life a whole lot easier! Whether you're close to home or far away, with only a quick glance you can rest assured knowing that your windows and doors are safe and secure. You can monitor your windows and doors or operate your between-the-glass blinds and shades from virtually anywhere with a smart device. Sync the Pella® Insynctive Bridge to a compatible home automation system to monitor and control your connected Pella® products from virtually anywhere with a smartphone or tablet. Between-the-glass shades and blinds are easy to program so you can have them raise and lower throughout the day, controlling privacy and adding comfort to your beautiful home. Best of all, you don't have to wrestle with hard to reach windows or spaces just to lower or raise the blinds. AND - you no longer have to worry about cleaning them! Using a simple smart device, raise and lower your between-the-glass shades and blinds and keep a close eye on the security of your windows and doors from virtually anywhere. The ability to program your between-the-glass shades and blinds to raise and lower at designated times gives you the ultimate in control. Pella® offers two levels of home automation management, so you can select the best option for your home and lifestyle. Pella®'s Basic level is perfect for in-home management, while the Advanced level allows for in-home or remote management of your Pella® products with Insynctive technology. Learn more today! 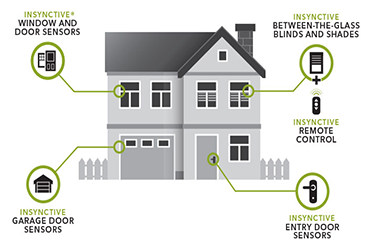 Control and monitor your Pella® windows and doors using built-in security sensors and motorized shades and blinds. We put comfort and convenience at your fingertips. This is where flexibility meets control. Choose between basic or advanced control and monitoring packages to pick the best option that perfectly fits your lifestyle. Pella® has teamed up with several providers to bring you a wide range of ​integrated home automation systems. Connect to your smartphone for on-the-go monitoring!